I found myself tossing and turning late last night. I couldn't disentangle nagging thoughts from my mind and just relax gently into my pillow. Perhaps I forgot to turn the oven off? Or forgot to turn off my daughter's lights? Or maybe I didn't return a very important phone call? Suddenly I realized what it was. Dessert! I didn't have dessert last night! Then my mind began racing; what dessert could I make tomorrow?! 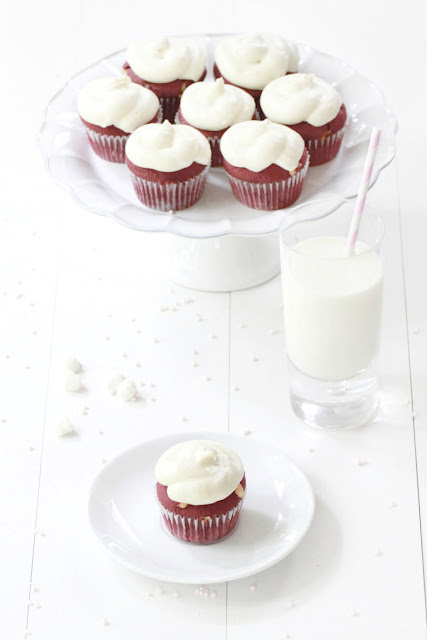 I knew exactly what to make....decadent red velvet cupcakes! Here in Santa Barbara we have arguably the most amazing cupcakery, Whodidily's. If you haven't been there, go...NOW! If you haven't been to beautiful Santa Barbara then make Whodidily's a priority your next visit. The fluffy, moist, deliciousness is extremely addictive and you will need more then one, so go hungry. Red velvet is undeniably an all time favorite cupcake flavor. It's a delicious blend of chocolate and vanilla flavors with a dab of red food coloring, giving it that distinctive velvety red color. 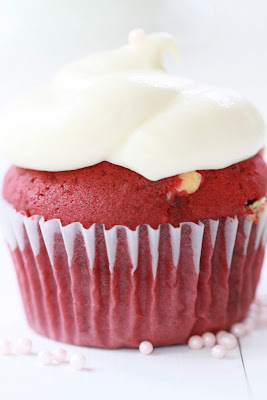 Red velvet is delicious on it's own but add some white chocolate chips for a hidden sweet surprise! Preheat oven to 350 degrees. Grease 24 cupcake liners. In a small bowl, sift flour and set aside. In a large bowl, on the medium speed of an electric mixer, cream the butter and sugar together until light and fluffy, about 5 minutes. Add the eggs, one at a time, beating well after each addition. In a small bowl whisk together red food coloring, cocoa powder and vanilla. Add to the batter and beat well. In a measuring cup, stir the salt with the buttermilk. Add to the batter in three parts alternating with the flour. With each addition, beat until the ingredients are incorporated but do not over beat. In a small bowl stir together the cider and baking soda and add to the batter. Stir in the white chocolate chips until well incorporated. Using a rubber spatula scrape down the sides of the bowl, making sure all the ingredients are well blended and the batter is smooth. Divide the batter among the prepared pans. Arrange the oven racks in the upper and lower thirds of the oven and bake the cupcakes, switching positions of the pans halfway through baking, until tester comes out clean, about 20 minutes. Cool the cupcakes before frosting. Using an electric mixer, mix the butter and cream cheese until smooth. Add the salt and vanilla and beat until well incorporated. Slowly add the powdered sugar until desired consistency. I tend to use less sugar since I like the tangy cream cheese flavor. 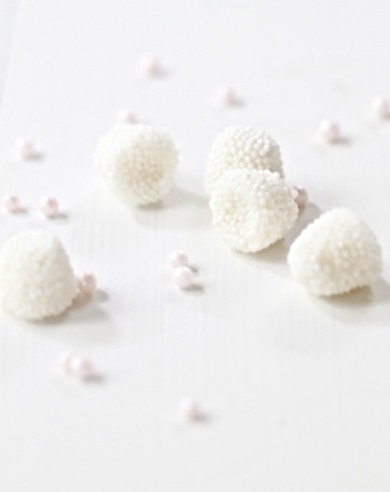 Frost cupcakes and decorate with candied pearls or sprinkles! What a pretty dessert! So pretty, and tasty! Now you have me thinking about what I am going to make for tomorrow. 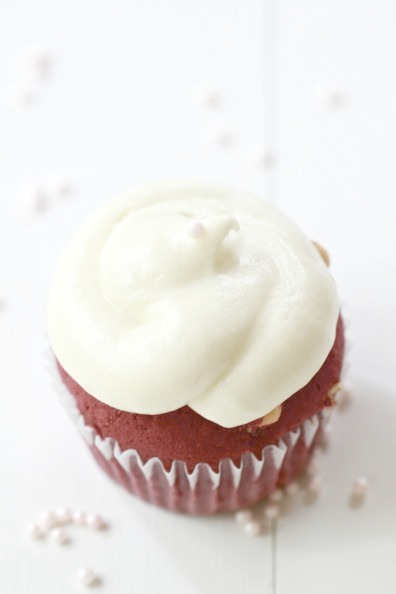 Magnolia's red velvet cupcakes are my all time favorite! Amazing photos. I love the whiteness and simplicity of the photos. Hi There, This is looking absolutely delightful. 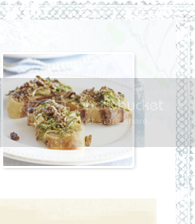 Loved the new combo of ingredients and the recipe is so nicely made and presented. 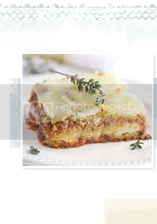 Saving this recipe of urs and wud love to give ur version a try on the coming weekend. Have a great day….Sonia !!! Yum!! I love red velvet! Oh my gosh if the cakes are that good I will be tossing and turning in my bed all night. These look awesome~ I read the directions but couldn't see where you added the white chocolate chips. Do you melt them and add them or just stir them in at the end? Wendy- Try to thicken up the batter a bit (add more flour.) You will see, when you make these cupcakes, the batter is on the thicker side and the chocolate chips won't sink. I hope this helps! I made these last weekend and they are DELICIOUS!!!!! The BEST cupcake I've tasted yet. One question though, how do you keep your chips from sinking to the bottom of the cupcake? All of mine just sank and had to be peeled from the cupcake paper. Ok, my apologies. I hadn't read all the comments before I asked my question! Oops! So to just work off of the answer already given, what would you suggest, working in 1/2 cup more at a time? EM ... here's a puzzle for you which I can't seem to work out. I'm interested in making a red velvet cake (sans cocoa powder) so that I can have more colors than just red. I was going to test the recipe using white chocolate (melted down) but really worried that this is a horrible idea! What do you think? Alternatively, do you think I could get away with other colors AND use the cocoa powder? 4 tablespoons seems to be a lot of food color. Did the flavor of these cupcakes turn out well? By that I mean was there an overpowering taste of food coloring present? I have tasted red velvet recipes before that did not have the right ratio of food coloring to the other ingredients and it was not good... I just wanted to make sure before I make these.